Here are two more banners for Waagh! Sophie. These are for the two HQ choices of the Waagh!, both Big Meks. I chose Big Meks as both HQ selections for two reasons – the first is because Big Meks allow you to take Dreadnaughts as Troop selections. The second is because I really wanted Waagh! Sophie not to be a big Ork horde army. I anticipate it going up against the Unsung, and Horde vs Horde makes for long and tedious games. Besides, Ork horde armies have been done to death and I wanted Waagh! Sophie to be different. She has a Freebooters unit of Flash Gitz that she loves, and I wanted to make that a centerpiece of the army, so I wanted to save a spot for that Heavy Support unit. Taking Big Meks and getting the Dreads as troop choices allows me to make Waagh! Sophie into more of a heavy support army and less of a horde army. When I figure out a name for the character I will put it in smaller glyphs on the two wrenches. 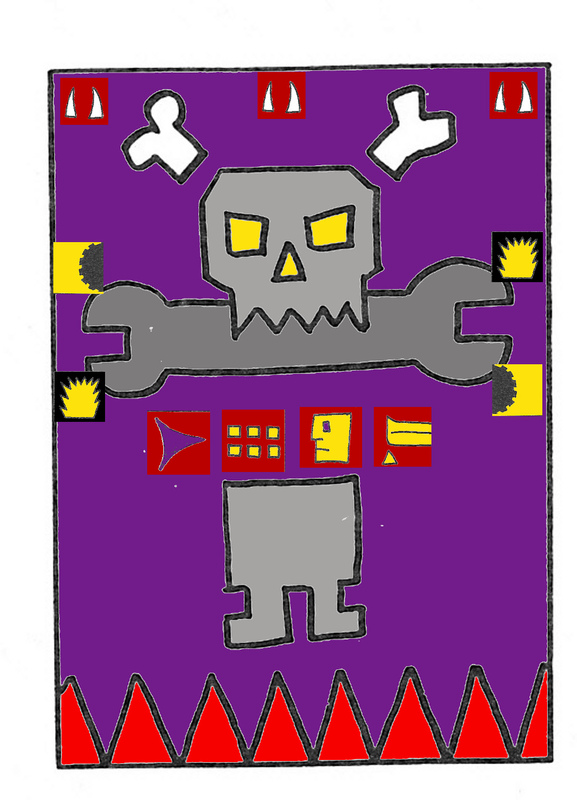 This is the back banner for my other Big Mek – Gogduruk Mortuff (“Ancient Feral Godlike Defense”). Formerly a member of the Snakebites, his bit specialty is protection, defense, armor, and vehicles (no wonder he got kicked out!). 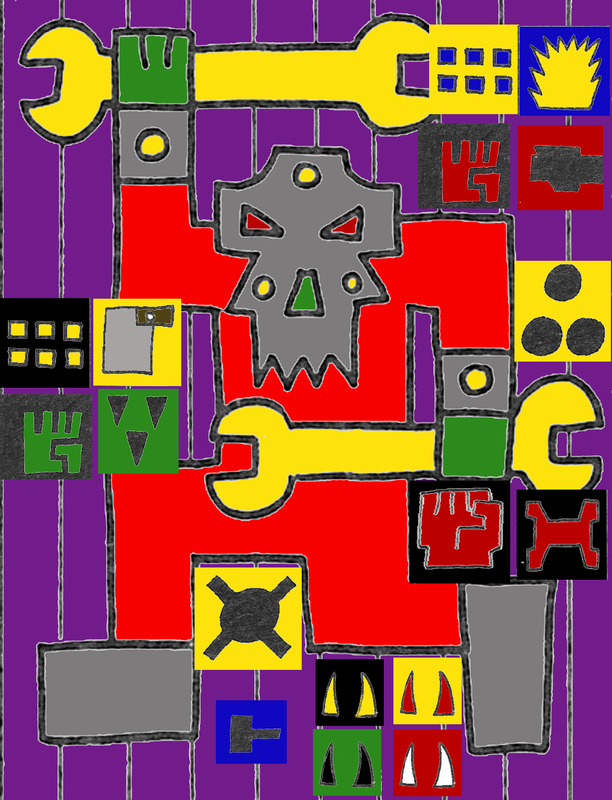 The glyphs at the top translate to “Outcast feral mek boss and warband for hire.” Glyphs down either side show services available (armor, custom forcefields, grots, boars, building, cybernetics, toughening, speed improvement). Here’s the first banner, for KILLA OF INFINITE GITZ! 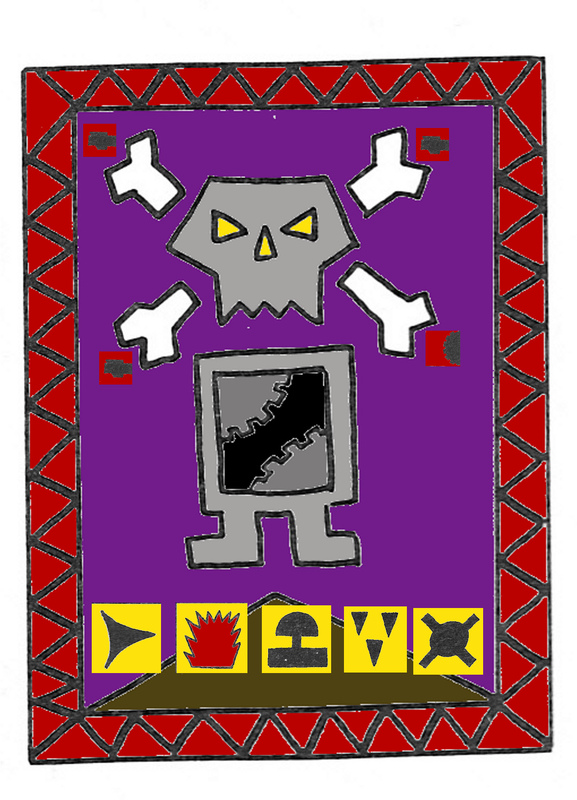 I chose purple, not a regular color for Orks, as a linking color for a lot of Waaagh! Sophie because I wanted it to be a Freebooterz force. The glyphs in the middle spell out the name (lit. Name lots gitz kill) and the yellow glyphs indicate the weapons on each of the four hardpoints of the dread – two close combat weapons and two shootas. The glyphs at the top are to remind everyone that this dread is extremely valuable, and worth a lot of teef! Renegade Shooter/Destroyer/Exploder is the second dread. 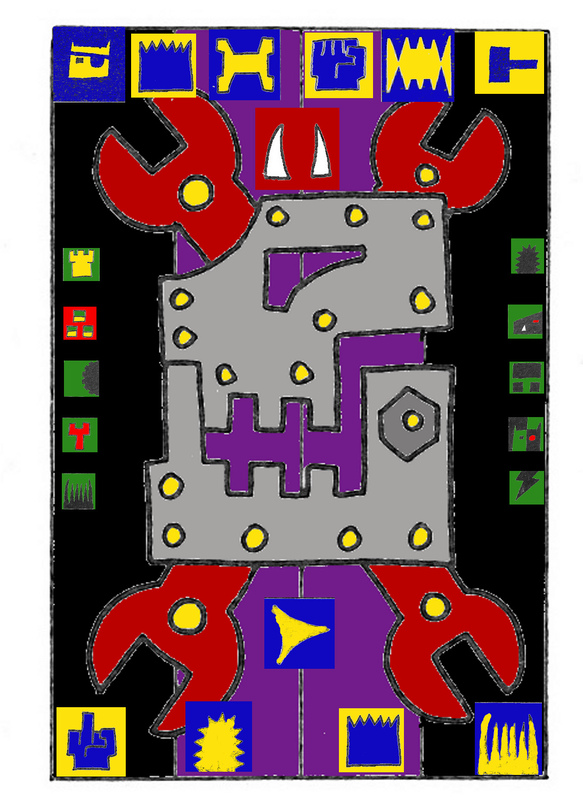 Again the name is spelled out at the bottom, and the armament of the dread is indicated by the smaller glyphs (which are currently red, but which I will probably change to a different color for visibility). Renegade is more of a ranged combat Dread, with only one close combat weapon and a bunch of blastas. I don’t have all the various additions figured in for these dreads yet, but when I do I will try to indicate them with additional glyphs. Both of the banners are based on old designs out of Freebooterz.